97 Comments This post may contain affiliate links. There’s something so delicious about the flavor combination of peppermint and chocolate! 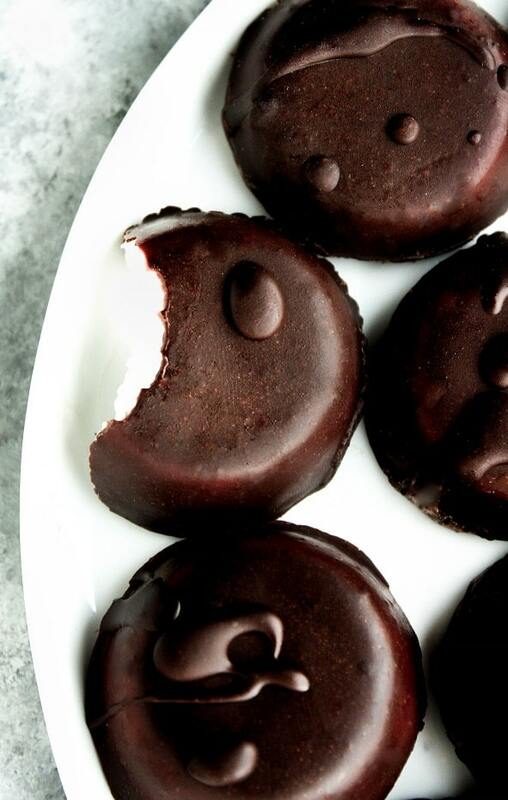 These Dark Chocolate Peppermint Patty Fat Bombs are sure to hit the spot. Just one is enough to satisfy your sweet tooth and keep you satiated between meals! I love to enjoy a fat bomb to fuel me through my busy days. Whether I am headed to a HIIT workout or out running endless errands, just one fat bomb is plenty to stave off hunger and keep me energized! Plus, they’re a great, entirely guilt-free dessert after dinner! Personally, I always have something sweet after I finish my last meal of the day. Restricting all desserts just isn’t a way I’m gonna live my life. 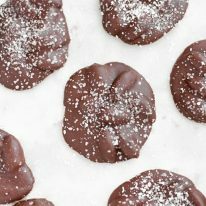 Just one of these Dark Chocolate Peppermint Patty Fat Bombs is enough to keep my sugar craving at bay! 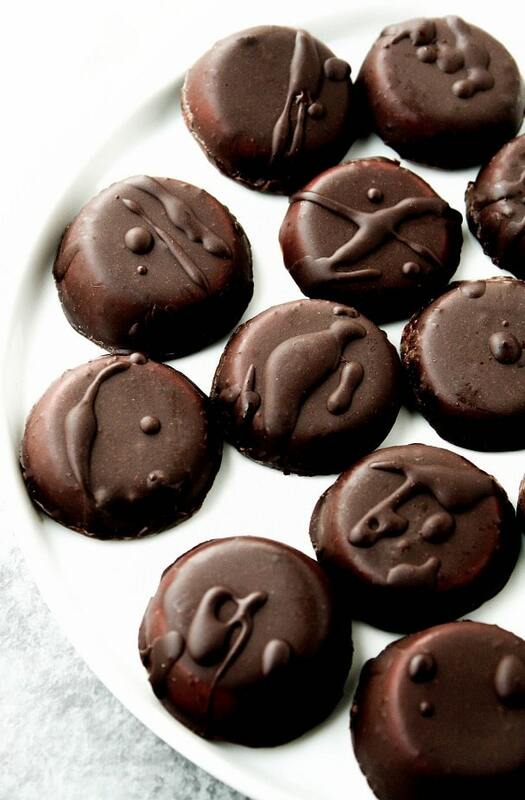 These Dark Chocolate Peppermint Patty Fat Bombs are sweetened with natural, net-carb-free monk fruit sweetener. I use Lakanto Monk Fruit Sweetener in virtually all of my ketogenic dessert and fat bomb recipes as it tastes just like traditional sugar and doesn’t kick me out of ketosis. If you’ve never tried monk fruit sweetener, I highly recommend it! You can use code “REALBALANCED” for 20% off your Lakanto order! 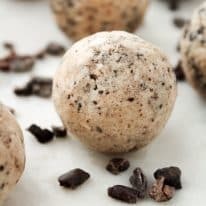 The preparation of these fat bombs is quite simple! The coconut layer can be mixed together, poured into a silicone mold, and sent to the freezer to set within minutes. I purchased the fat bomb mold I used in this recipe on Amazon and it has been a great addition to my kitchen! I make fat bombs quite often and being able to pour a liquid mixture into the fat bomb mold makes the solidifying process incredibly easy and hands-off! The step that I would suggest being the most diligent about is the melting of the chocolate as it can easily burn in the process of microwaving. As a note, if your microwave has a high-wattage (900 watts or more), I would recommend melting the chocolate over medium low heat using a double boiler method. One fat bomb is only 0.3 grams net carbs! This recipe is low-carb, keto, egg-free, nut-free, gluten-free, grain-free, vegetarian, and refined-sugar-free. So if you have any nut allergies or have nut intolerance, these nut free keto fat bombs make for an amazing yet safe, keto dessert-snack! You can find all Real Balanced fat bomb recipes here! Looking for more amazingly delicious keto recipes? 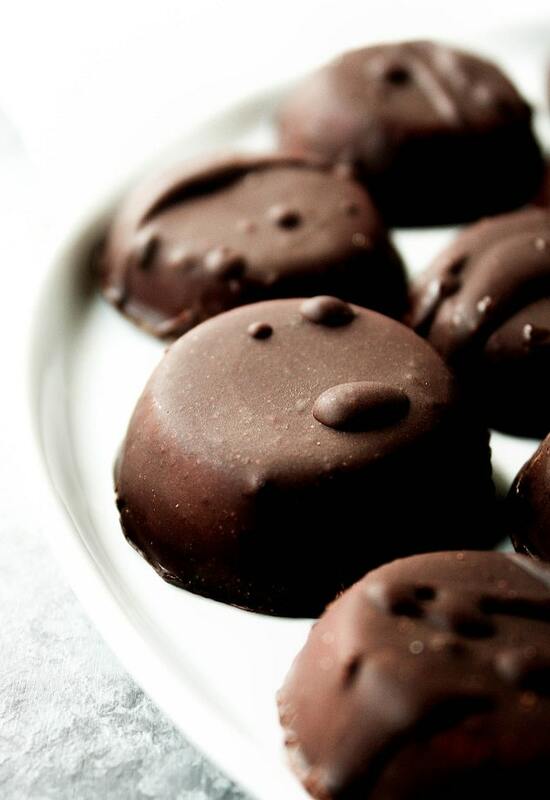 These Dark Chocolate Peppermint Patty Fat Bombs are a delicious and low-carb chocolate treat! This recipe is keto, low-carb, nut-free, gluten-free, grain-free, vegetarian, refined-sugar-free, and contains only 0.3 grams of net carbs per serving! Using a hand mixer, mix together peppermint extract, coconut oil, shredded coconut, monk fruit sweetener, heavy cream at speed high enough to turn mixture into paste. Scoop mixture into silicone mold. Place silicone mold in freezer and freeze until solid, about 1-2 hours. In a microwave-safe bowl, in 30 second increments, microwave chocolate ingredients until melted, a little over 1 minute total (**see note below!). Stir after each microwave session. (Be very careful to watch during this process. The mixture should remain thick like melted chocolate). Remove silicone mold from freezer and pop coconut mixtures out. 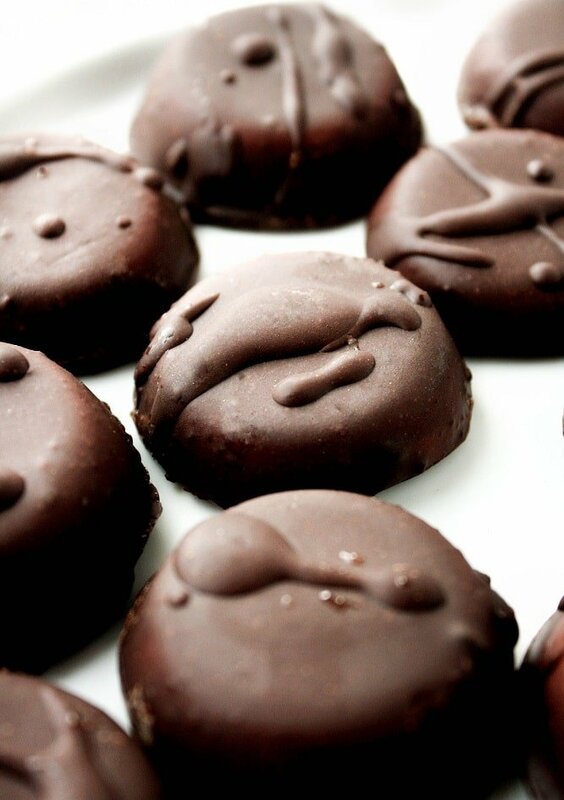 Once chocolate-coating has hardened, remove from freezer and enjoy! Store in freezer and allow to thaw and soften for 10-15 minutes prior to eating. **The microwave used to develop this recipe and melt the chocolate was 900 watts. If your microwave is stronger, you will likely need to decrease to 50% power. If your microwave is much stronger than 900 watts, I recommend melting the chocolate ingredients over a double-boiler. Really good but instead of the chocolate mixture I just melted 1 cup Lilly’s chocolate chips and 1/4 cup coconut oil. Less fussy and tastes awesome! Will be making these again, thanks for the recipe. So glad you enjoyed, Tracey! I melted the raw cocoa butter over double boiler, but it came out very watery. I’m so sad as this bag was $10.99. In small increments, whisk in a little more heavy cream and that should bring all of the chocolate ingredients back together. I ended up coating them. Letting them freeze and then adding more of the chocolate. Next time I’ll try adding more heavy cream. Hi! 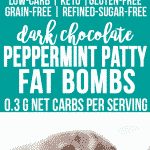 Do these peppermint patty fat bombs taste like coconut or does the peppermint flavoring win over? 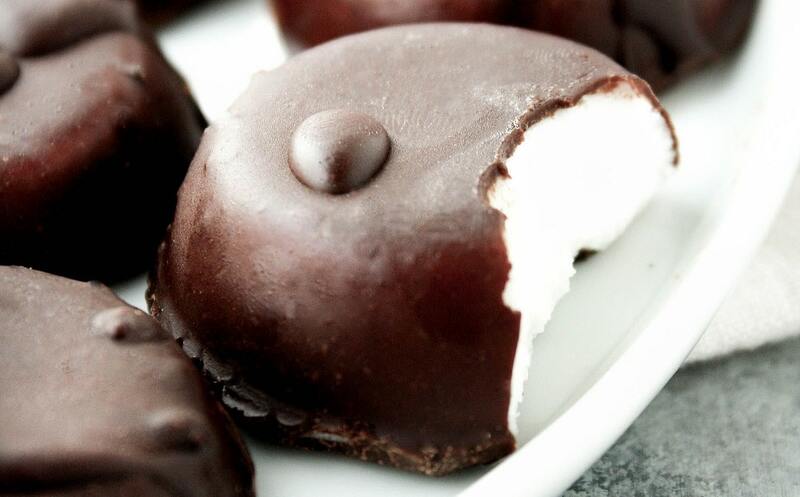 I’m not a big coconut fan but love peppermint patties! I personally don’t taste the flavor of coconut in these, but if you aren’t used to using coconut product, you may slightly taste it. I’d suggest getting refined coconut oil (rather than unrefined, virgin coconut oil) as it doesn’t have as strong of a coconut flavor. Love this recipe! Just have a question. I tried to fill up a 24 silicone heart cup sheet with the mix but only managed to fill about 14 leaving me 10 short of what the recipe recommends. Am I filling the cups too much? I’m worried I did something wrong and that the calorie count will be off. Hi, Lindsay! With the silicone mold I used in this recipe, I evenly split up the mixture. If the molds of yours are larger, that will change how many the recipe will yield. I’d suggest entering the recipe into a calorie calculator (I use MyFitnessPal) and manually entering 14 servings so you’re able to have accurate calorie and macro content for your fat bombs. Hope that helps! Thanks for your comment! Would it be okay to make these in an 9×13 pan and drizzle the chocolate on top in a second layer? I don’t have a silicone mold and don’t really want to buy one. Yes, that should definitely work! Just be sure to line the pan with parchment paper or it’ll be really difficult to get it out. Enjoy! hi, Alexis! Unfortunately no, they aren’t the same. Cocoa butter is used to make chocolate and has a very different consistency (and a different taste) than coconut butter. You could, however, follow instructions on a dark chocolate bar and melt that to use as the chocolate-coating. These look amazing. 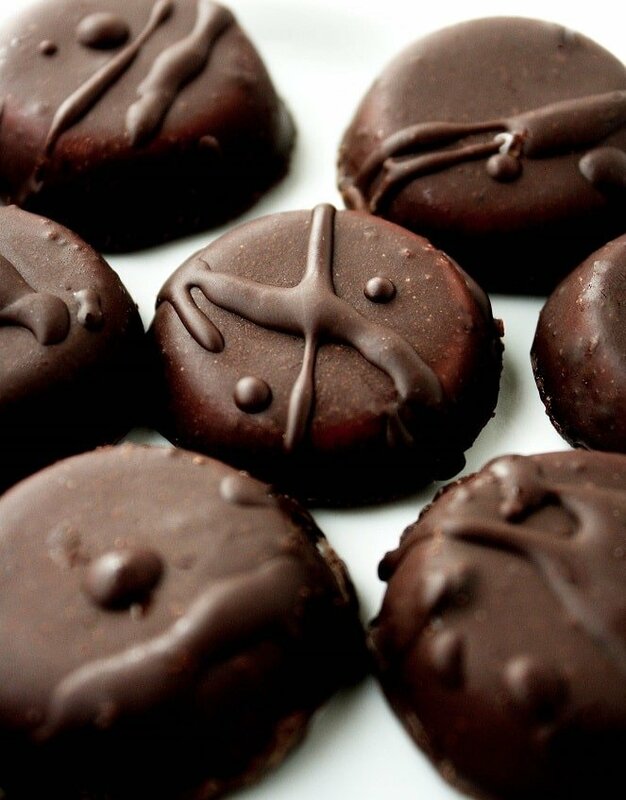 I actually just started keto today and I LOVE peppermint patties so this will be perfect! You have so many recipes that look great! thanks, Stephanie!! These are a household favorite of ours! I hope you enjoy!